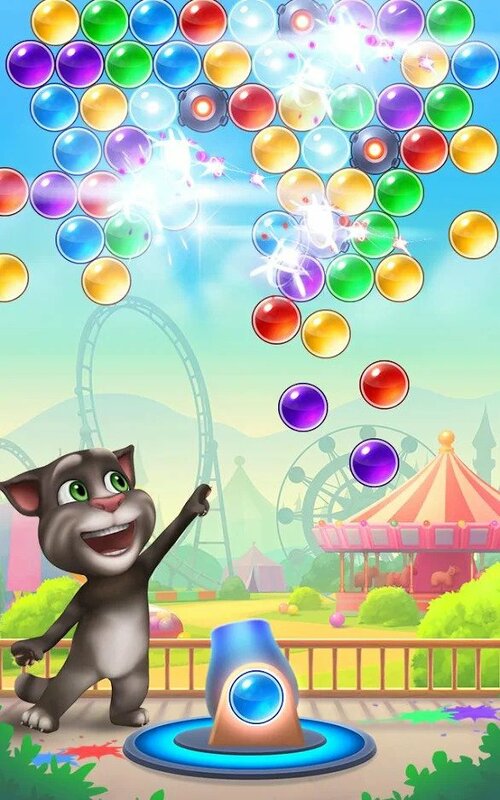 Talking Tom Bubble Shooter is a competitive bubble shooting game starring your favorite talking cat and his buddies. The game pits you against AI or a random player and the goal is to match 3 or more bubbles of the same color. While matching, the player has to make sure the bubble wall doesn’t touch the danger line, else the game will end with the opponent declared as the winner. A player wins if the opponent’s bubbles touch the danger line first.When the bubble battle starts, the inset at the upper-left corner of the screen shows how your opponent is faring in the game. If you win a PvP match, you will receive some coins and a sticker packet if you rank up. You will earn battle points for every win and bonus points if you are on a winning streak. When the border of the game board’s upper part glows, it suggests that the wall of bubbles will descend one step lower. Consider this as a warning glow. This is when you should be extra careful with your shooting. With every step downwards, the bubble wall will get closer to the danger line. The best strategy is to get rid of the first row of bubbles, as this part of the wall will touch the danger line first. Try to make the wall shorter by removing first row of bubbles. The game does not let the wall descend immediately and it may take more than a couple of shots before the bubble wall comes down, so try to get the best match in your first attempt and target same-colored bubbles on the first row, then the second and so on until the wall reduces to just two or three rows. Your aim should be to decrease the wall size to 3-4 rows. Squeeze bubbles into gaps or empty spaces, but don’t just keep shooting at the first row. The more bubbles build up on the first row, the faster the wall will touch the danger line. The shorter your wall, the longer the time it will take to hit the danger line and by that time your opponent’s bubble wall may have come way closer to the line. I have noticed that making more matches and reducing your wall considerably makes the opponent’s bubble wall come down faster. Basically, you send extra lines for every bubble you match. So keep matching 3 or more bubbles to make your opponent’s wall get past the line faster. In several occasions, you won’t find any potential match on the first row of the bubble wall. Try to bounce the shooter bubble off the side walls at a proper angle to access hard-to-reach areas. Bank shots can be extremely useful if there are a several same-colored bubbles in areas that are difficult to access. With the help of a bank shot you can squeeze bubbles into gaps. It’s quite a popular and well-tried tactic employed by most bubble shooter players. Noticed a number on a big red bubble just above the “PvP” button? Well, that’s your player vs. player rank. You reach a new rank once bubble border fills up. Play and win more PvP battles to fill the rank meter faster. Once the meter is full, a random sticker set will be given to you absolutely free. You also get sticker packets in single-player levels. Levels 5, 10, 13, 17 etc have free sticker sets for you. Some levels contain a rare (gold) sticker. Such sets are usually available in boss levels. For example: Reaching level 30 will give you a rare sticker set. You should always trade coins for stickers from random players if there’s just one sticker missing from a poster. Tap on the sticker packet icon on your home screen and tap on the trading button at the lower-right corner of the screen to access the trading screen. The game lets you see what others players may have in store for you. Their duplicate stickers will be available for sale. Just like them, your duplicate stickers will also be sent to the sticker marketplace automatically. The price of a duplicate sticker is set by the AI, which is kind of disappointing as it should give players some flexibility to set their own price. I wanted a number 9 sticker to complete my Talking Angela poster. I won levels, both PvP and solo levels, earned coins and traded 200 coins for the number 9 sticker from a random player in the “Trade Stickers” section. This not only gave me a new character, but also opened a new page. A complete poster or posters will unlock a new page. And this also opens the door to new stickers which you may receive while playing PvP matches and solo levels. They will appear randomly on the game board. When you see a bomb, just aim and shoot at it to detonate it and remove nearby bubbles. The bomb can be very useful in PvP battles, but won’t appear every time. If a bomb is hard to reach, then try the banking shot to blow it up. Many times some bubbles will dangle from a set of same-colored bubbles. Look for such a set-up and aim for the higher bubbles to get rid of the bubbles hanging off of them. This will trigger a massive drop and also remove the first row of bubbles pretty fast. The bank shot trick will work if you are trying to removing those low-hanging bubbles. In a PvP battle, use a power-up when the bubble wall is very close to the danger line. A power-up can be used only once in a game, so be careful with what you choose. You will need to collect stickers to unlock them. There are 3 main types of power-ups: Lightening, Bomb and Laser. The lightening power-up bursts a group of bubbles anywhere on the screen. Use it when you see the first row of bubbles getting close to the danger line. Use the bomb to destroy a group of bubble. Use it when you can’t find a match and a chunk of unwanted dissimilar bubbles needs to be destroyed to make way for new bubbles. The laser can be great weapon to shoot down unwanted bubbles. It shoots a power beam through the bubble wall destroying any bubbles it comes into contact with.